Read Annalena's latest article on the Portland SE Examiner, about the Power of Hypnosis with EFT, for Self Sabotage and more! Annalena is the founder of "A Happier you Hypnosis Company". ​​​She holds a PhD in Linguistic Science (thesis in Psychoanalysis & Neurolinguistics), received by the university of linguistic studies "Aldo Moro", in Bari, Italy, where she was born and raised. She is a Certified Clinical Hypnotherapist (C.H.t. ), Master Hypnotist (M.H. 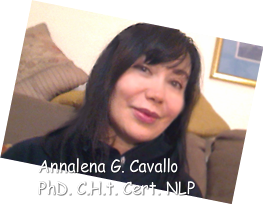 ),Certified Neurolinguistic Programming Practitioner (NLP), trained in Hypnosis and NLP, under ​Dr. James Peal, at the Advanced Training Institute of Santa Barbara, CA. Annalena is also a member of the Oregon Hypnotherapy Association and Board member of the” CWG Center of Portland” Foundation. Furthermore, Annalena earned an Intuitive Arts & Counseling Award in 1997 at the ​​H. McKenzie Hypnotherapy Center of Santa Barbara, CA. She is also a Meditation instructor, trained in San Francisco (CA), by the Yoga & Meditation teacher Cindy R.Chan, and a REIKI Energy Healing Master, trained in Santa Barbara (CA), by REIKI Master Teri LaPadaka. She has been providing Hypnosis for Stop Smoking, Weight Loss Hypnotherapy, Hypnosis for Confidence and more, integrated with Neurolinguistic Programming, for over 17 years, dedicated to assist her clients in changing and enhancing their lives, and reaching their goals with success. in relationships, finances, career, and other areas of their life path! Annalena works both locally in Portland, Oregon and world-wide. 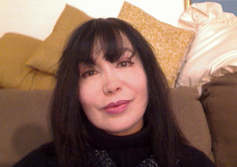 Her philosophy is "There Are No Permanent Obstacles, Negative Outcomes Can Be Changed Into Positive Ones"
Currently she writes articles about Hypnosis, the Power of the Subconscious Mind and Subconscious Beliefs, Energy Medicine, Dream Work and Interpretation.​ Some of her published work includes a book " The History of Organized Crime in America". She has also written several fairy tales, one of which- "The Violet and the Butterfly" received the third prize in the European contest "Andersen's Bay of the Fairy Tales", and was translated into Italian. The offices are located in SW Portland, Oregon, and in Santa Barbara, CA, sessions are still held at the office on West Arrellaga and ​at the La Cumbre location as well.